At times, they can be whiny, grumpy, sneezy and any of the other dwarf names I can't remember at the moment. Often, taking them out in public places where their behavior and my parenting skills are on display can be a lesson in patience for me and tolerance for everyone around us. But sometimes... sometimes, they can be really, really good. One day a couple weeks ago, we were wandering around Sam's Club where I like to take them to eat free samples for lunch so I don't have to cook, looking for paper towels and whatnot, and I guess all the stars were aligned or something. Maybe Venus was in retrograde, or they had just both gotten EXACTLY enough sleep the night before, or maybe they were just wowed by the possibilities that are available when we were outside of the house for once, but they were being good. Really, really good. Funny. Polite. Engaging. As we were walking around, looking at giant sized cans of tuna and quadruple packaged loaves of bread and such, we were talking and laughing and having a good time. It's POSSIBLE we may have been playing the "which superhero is stronger?" game, in which we take turns naming two superheroes, then the rest of us make arguments for or against each one winning in a battle. This is considered one of the highest forms of amusement available in my family. Aren't you jealous? Anyway, not ten minutes into our trip a man approached us as I was trying to decide whether or not my family needed a five gallon bucket of peanuts. "I've been watching you," he said, which, it turns out, sounds way worse than it really was in this particular case. "Those are some mighty fine boys you've got there." Now at this point, my STRANGER DANGER and CREEPO FACTOR alarms were blaring, but they do that pretty much all the time anyway, so I just smiled and said "Well thank you." The man proceeded to chat up the boys a bit, and Zachary gave him a prompt "Yes, sir!" when he asked something inane, like "Do you always listen to your Mom?" Cooper, ever the Zachary-parrot, piped up with a "Yes, sir!" too, and it was a beautiful moment that made me look like the best mother in the entire world. Which, as we all know, I'm not, but still. It was a MOMENT. The man chatted a little bit more, then as he was walking away, Zachary yelled "Have a nice day!" which was immediately followed by the Cooper-parrot, "Have a nice day!" The man stopped, turned around and looked me in the eyes and said "Wow. Congratulations Mom. You are doing something right." And seriously? It was the best feeling ever. Now I have never seen this man before and likely never will again (and if we were to meet again, chances lean toward it being not quite as good of an interaction) and his opinion of my parenting skills really means nothing in the grand scheme of my life, but in a world where people are often quick to judge and scrutinize every little details of others' failures, it was wonderfully refreshing to have someone point out something positive to me. 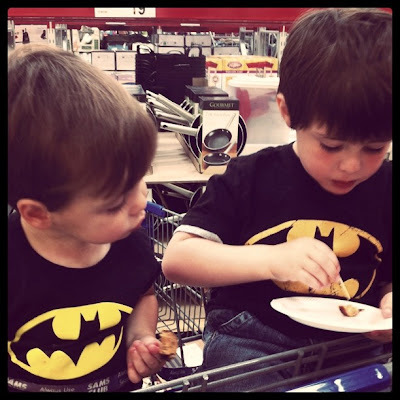 We finished our shopping and as we were checking out, the cashier, who couldn't have been more that a dozen or so years older than Zachary, listened to us continue our conversation - "What do you mean you think Batman is stronger than Superman? Everybody knows Superman is the strongest superhero ever," and "Yes, I definitely agree. Batman could take out Spiderman any day," and he said to me, "I want to be in your family." I walked out of Sam's club that day feeling like the best mom in the world, and it almost - ALMOST - made up for all the times I've drug my crying children out of a store without buying what I went in for or snapped at my whining kid in the checkout lane "NO YOU MAY NOT HAVE THAT!" It made me realize that complimenting a child's behavior is one of the best gifts you can ever give a parent, and since then, I've been looking for opportunities to do just that. Parenting is by far the hardest thing I have ever done and ever will do. Don't let anybody kid you. It is challenging and complex and tricky and demanding and nobody, no matter what kind of image that person portrays, believes him or herself totally competent in it all the time. Even the really great parents out there have doubts about their abilities. So if you get the chance to compliment someone's kids, do it. Because it's really amazing what 20 seconds of kindness on your part might do to change someone's entire day. I love nothing better than getting compliments on my kids' manners. That and their sense of humor - I love when someone "gets" my kids. As my boys have gotten older I've sought out opportunities to praise well-behaved kids in stores and restaurants, and the looks on the parents' faces prove how much it means to them. Those of us who have been there need to support the parents years behind us. It's important. Angie, you're so right. It IS important to support each other as parents. I often wonder why it's so easy to be snarky and judgey about others but it's often so hard to be supportive... I totally agree with you on the sense of humor thing, too. I think my kids are darn funny, and it thrills me when others see it, too. I do it every chance i get for those very reasons! It IS hard, isn't it? People don't say that often enough, and I think that feeds into the idea that it should be effortless. It's NOT effortless.